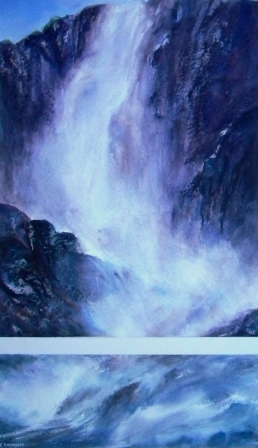 This entry was posted in art, painting, Tasmanian artists, Uncategorized, watercolour and tagged Fabriano Torchon paper, gushing water, LAS exhibition, Meander Falls, Meander Valley, Meandering, Mrander Fallls, painting movement, Tasmania, Tasmanian art, Tasmanian landscape, watercolour textures, waterfall, wet-in-wet watercolour. Oh Evelyn – how lovely to hear from you and you are doing well, making plans for even more exciting time teaching NEW things, making space for us to join you and share your knowledge and your wonderful energy. Even just to be able to watch you and listen to you is worth coming along for me. I’ll let you know as soon as i hear from him.